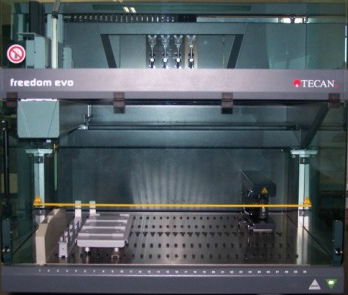 The Freedom EVO 100 is a compact liquid handling workstation. The Freedom EVO 100 has a 100cm length work surface and is designed to accurately handle repetitive liquid transfer tasks from individual wells, or up to 8 wells simultaneously. EVO 100 is also available with either a 96 or 384 channel head for processing whole plates. Freedom EVO can be configured as either as a stand-alone instrument or as part of a turn-key automation system, enabling varying degrees of walk away time for genomics, proteomics, cellular biology or analytical biochemistry assays. Other popular automated applications on the Freedom EVO 75 include: Nucleic acid extraction ELISA assays Setting up PCR and sequencing, reactions Serial dilutions MALDI spotting and in situ hybridization (ISH), Capillary electrophoresis set-up. Hardware options available; MCA96 head, MCA384 Head, RoMa gripper arm, Te-MagS separation module, Te-VacS vacuum separation module, Te-Shake plate shaking station, hotel storage racks and incubators, plate or tube racks, trough carriers, plate readers, plate washers, PosID Identification System, LPT 220 EVO Carousel, Te-Stack loader.